Barbecue done the right way is worth fighting over. 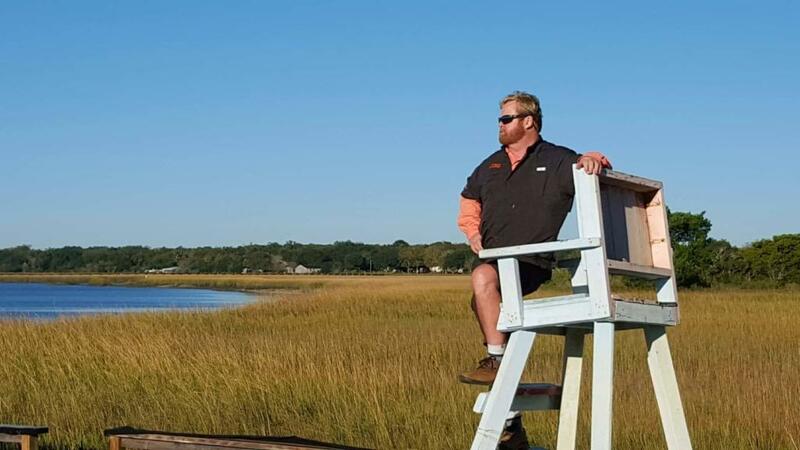 Just ask Gregg Howard of Charleston’s RightOnQue. It is a challenge he embraces. Tonight, he battles Chef Shannon Ambrosia on the Cooking Channel’s new show, Big Bad BBQ Brawl. The Brooklyn based chef takes his skills on the road to see if he can compete against the best pitmasters in the South, and tonight that means Howard. Who wins in a knockout? Tune in tonight at 10 pm to find out. In the meantime, we thought this would be a great time to begin our new series Conversations Around the Burn Barrel, in which we profile SC BBQ pitmasters and restaurant owners, with one of Charleston’s finest. 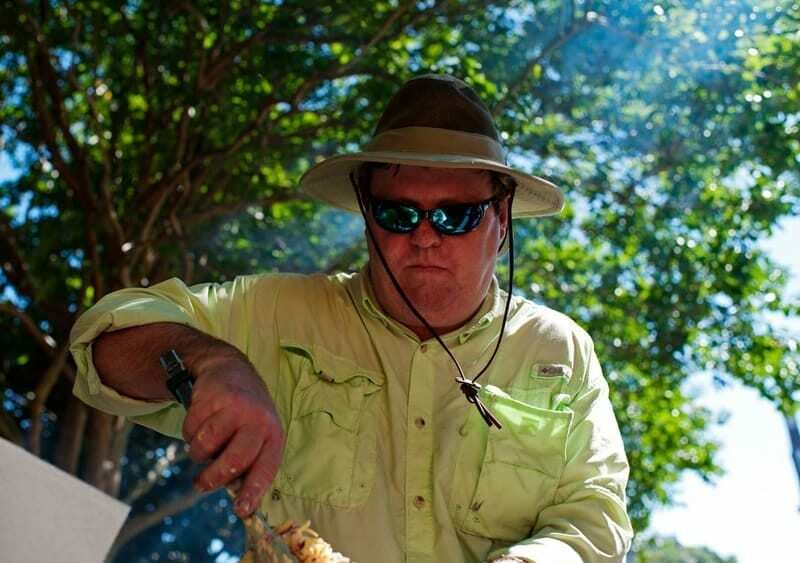 Gregg has a passion for real barbecue: BBQ made the spirit of his mentors and forefathers, using artisanal methods and using hardwoods as his only cooking fuel. Barbecue made in this way is special, as are those who carry on the practice today. Known as True Cue, Howard is one of a shrinking number championing these historic methods. 1) Tell me how you first got involved with BBQ. 2) What’s your earliest important memory of BBQ? “Enjoying the family barbecues that my dad always helped with. We didn’t do it that often, but when we did, everyone enjoyed working together prepping and cooking the meat, telling stories and talking as it cooked. 3) What do you wish people knew about your restaurant/BBQ? “That all barbeque is not created equal, and that true cue is defined as meat cooked over wood at low temperatures and it’s a really long slow process if it’s done right. Our meats are prepared artisan style, usually made in custom orders. Consequently, you won’t get anything but the freshest que and sides. Our coleslaw is freshly grated from cabbages, usually from Joseph Fields Farms, and is not bought in bags already shredded. 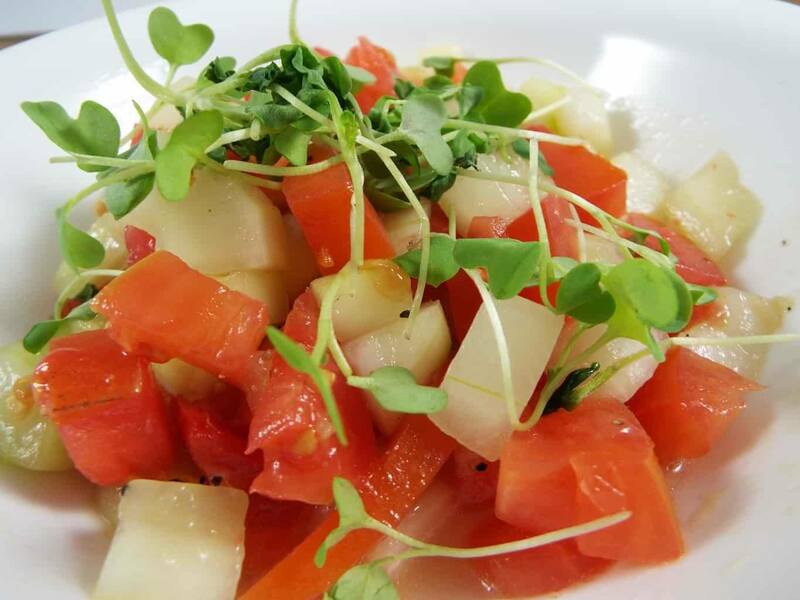 Our cucumber and tomato salad is served when cucumbers and tomatoes are in season and also bought from Joseph Fields Farms, so it’s literally farm to table. We have a lot of other sides that we cook for catering, most popular are usually the sweet potato mash and rustic mashed potatoes, collards, green salads. 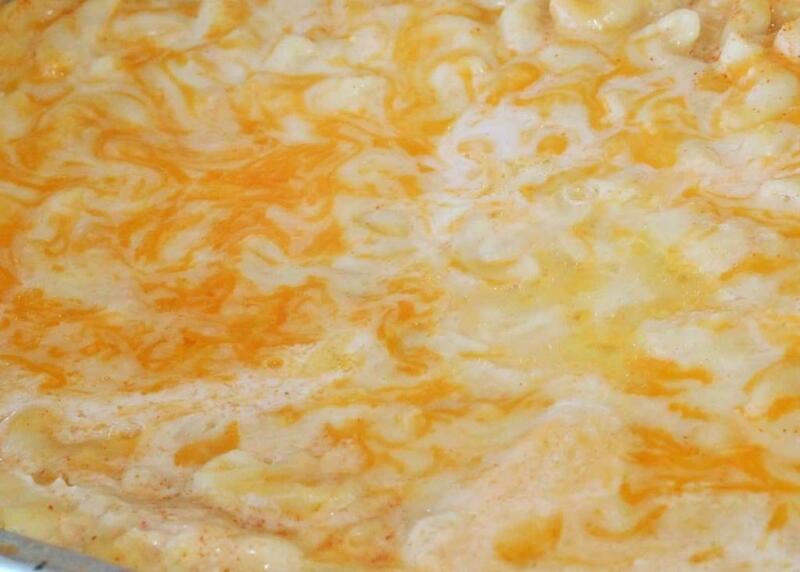 Our macaroni and cheese is a traditional Southern style, with my mom’s recipe. 4) What might your customers be surprised to know about you? 5) What is special about your BBQ/restaurant? “It’s real artisan barbecue, made as my Charleston ancestors and relatives smoked it. 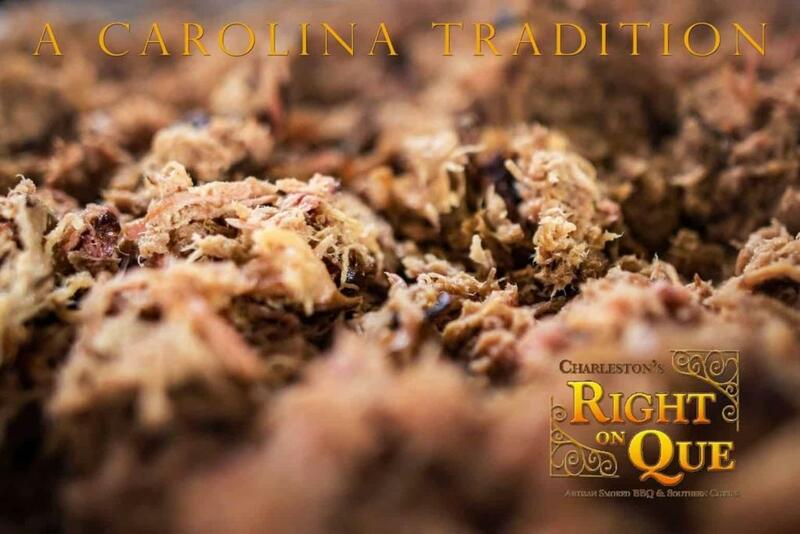 This is authentic SC BBQ, made with locally available woods to add appropriate flavors to the smoked meats. All wood, all the time. 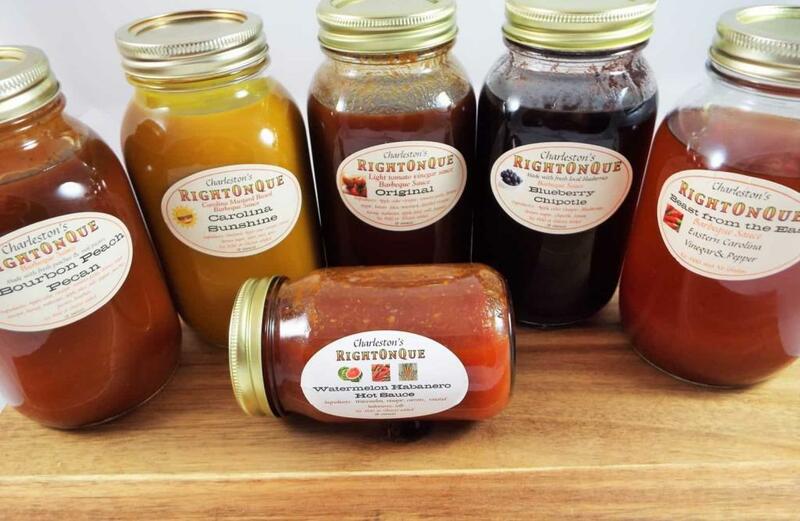 All of our sauces are house-made, flavorful, fresh, with no junk added to them. We’ve found that if we stay away from MSG, high fructose corn syrup, GMO products, and in general, added chemicals, we feel a lot better after we eat. We are fortunate to have access to local farmers to get the best produce possible for our side dishes. We currently use the local Saffron Bakery’s brioche buns for all of our sandwich buns. We could serve it on something else, but we like providing the best for our customers. 6) Tell me about your sauces. None of our sauces have any MSG added, and all but the Bourbon Peach Pecan sauce are gluten-free. Real Bourbon is added to the Bourbon Peach Pecan sauce, so it technically cannot be considered gluten-free, according to the newest rulings. 7) Talk about your BBQ. “It’s a passion for me. Still use a closed pit stick built smoker, working around hot spots, splitting wood that a buddy delivers to me as he clears his land, and tending fires through the night. 8) What is one thing most people don’t understand about BBQ? “The length of time and labor to prep heavy meat and cook it low and slow over wood. We understand that some people prefer braised barbeque. And we think it has its place. 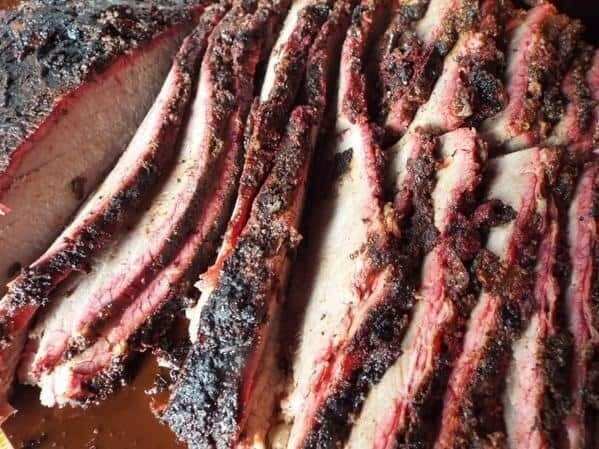 But true BBQ to us will always be smoked, by definition of barbecue or barbacoa. It’s a little frustrating when trying to explain the difference to potential catering customers. How do you tell them our barbecue might cost slightly more than the que that’s set on gas-cooking auto-pilot, or set in an oven to braise with a few wood chips because those methods require less labor and can be done in large volumes? We’re still a small company, so we’re custom making orders for smaller groups. Our methods result in a great product for the customer, but high volume brings higher financial gain. 9) What’s on your plate when you eat BBQ at your own restaurant? “Brisket if there’s any left, ribs if there’s any left, pulled pork, que rolls, cucumber, and tomato salad. If we use sauce, it’s never on brisket, rarely on ribs, and it’s usually the Original sauce- sometimes with some of our Watermelon Habanero hot sauce. We like the pulled chicken mostly for using in other recipes, like soups, nachos, pasta dishes, etc. 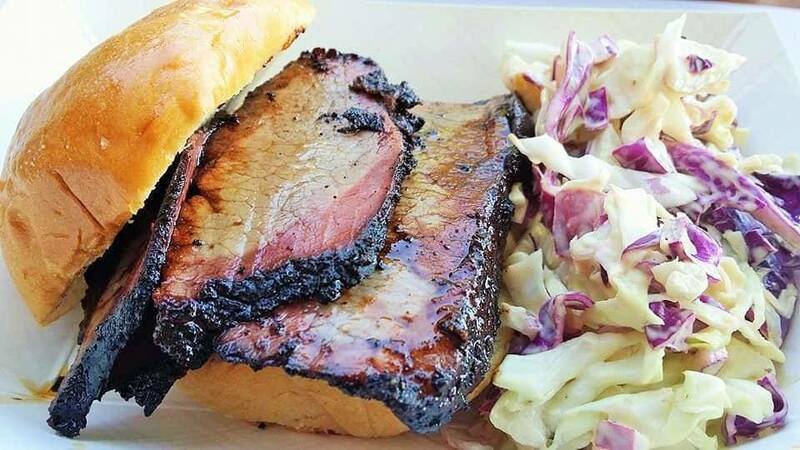 As a native South Carolinian, it’s true – we prefer pork bbq always, except in the case of brisket. 10) What advice/tips do you have for the amateur? “Watch TV and/or videos. Talk to the pitmasters at the restaurants you visit, or maybe even better, to someone in your circles who knows how to smoke. Maybe even take an SCBA or KCBS judging class to learn what makes great barbecue. Take away from everyone what seems smart. Be observant when you smoke to see what’s working well and what’s not. Watch out for hot spots. Experiment a lot with family and friends; they’re your best initial critics. Start with pork shoulders/butts and maybe chicken. Then try ribs, and lastly brisket, if you want to go from easiest to hardest. 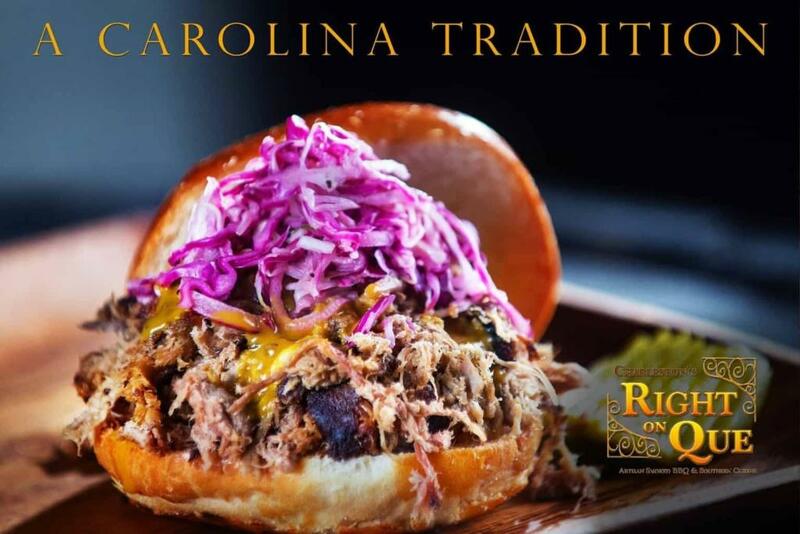 11) What would help SC BBQ as an industry? “If somehow BBQ could overcome the original stigma as the way to cook cheap cuts of meat. The cost of those “cheap” meats have gone up so drastically, even in the last few years, that it should instead be compared to a great grilled steak meal price wise…especially when you consider that the length of time to smoke. 12) What is the best thing about your work? “Compliments from the customers and great reviews. The fun of switching up the menu every now, and then to add corned beef brisket hash or que rolls to the menu. 13) Who played the biggest role in your start in BBQ/restaurant business? “My wife was the one who first encouraged me to pursue my passion as a business. A friend of mine and I started this company. While he wasn’t big into the food business, he knew social media, was detail oriented, and just made it fun. 14) If you could sit at the table with anyone, past or present, famous or not, to share a meal, who would it be and why? 15) Talk about your typical day. “Review and respond on social media and emails. 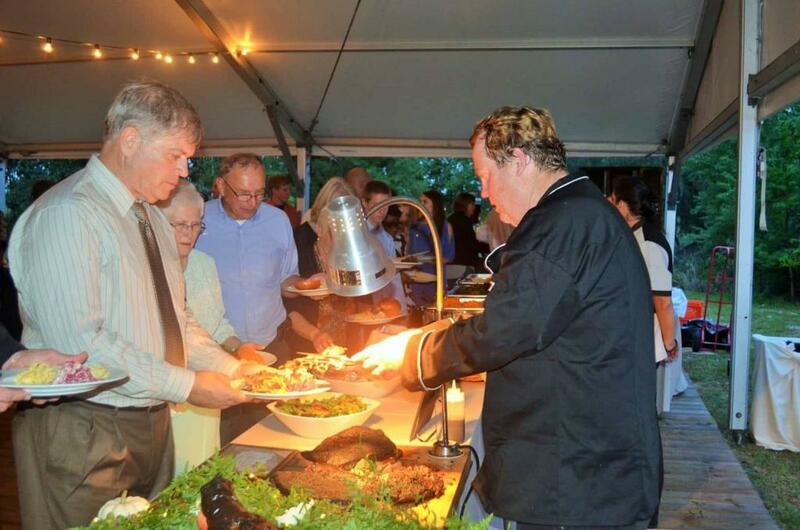 Read and respond to catering requests. Go to the stores for either disposables, meat, side dish ingredients, or equipment. Prepare side dishes and meats, as well as rubs and sauces for the Charleston Farmers Market on Saturdays, and catering events. 16) Talk about the name of your restaurant. “The name just came to me one night in the middle of a dream, so that’s what we named it. 17) What is unique about SC BBQ? 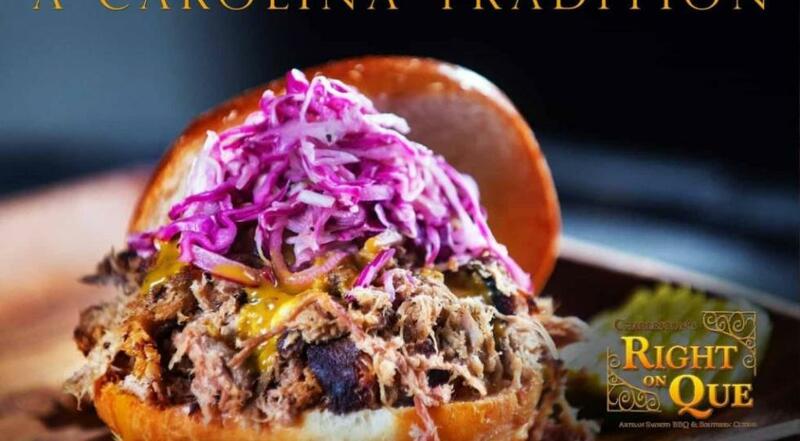 “SC is the one state that has four regional barbecue sauces – mustard from the German settlers, light tomato vinegar from the Pee Dee area, Eastern Carolina vinegar and pepper, and the heavy tomato, sweeter, KC style that we consider more of a national type sauce. 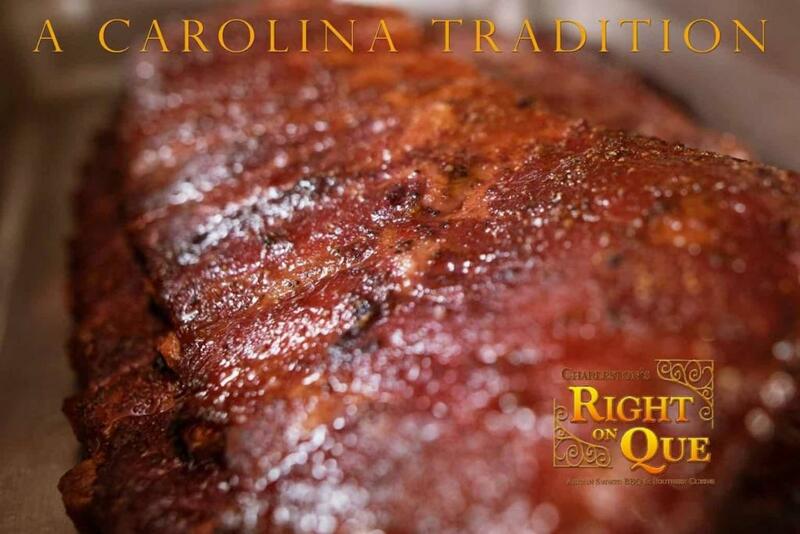 SC BBQ ribs are traditionally pork, and pork is the meat of choice for barbecue in SC. 18) Do you eat other people’s BBQ? Any places you recommend? 19) What is the most rewarding part of cooking BBQ? 20) Anything else you’d like to share? “We set quality as our predominant goal. We will only provide True Cue — as you’ve certified our barbecue to be — because we believe the quality comes from the process of cooking bbq over wood smoke. We also want to provide our customers with fresh, not canned or frozen vegetable dishes – home gardens and fresh vegetables were an important part of our southern upbringing. Another reason we love the Charleston Farmers Market, Sunday Brunch Farmers Market, and all of our local farmers. Joseph Fields Farms entire farm is certified organic, and they are such a great group of people to work with. The Charleston Farmers Market is an excellent place for the locals to buy their produce for the week – there are so many farmers who pack up their produce in boxes and trucks and drive them, set them out, then repeat all that work in reverse order to go home. That’s a lot of work and we are so blessed to have the ability to buy fresh farm produce, as well as eggs. Grow Food Carolinas also offers an opportunity for businesses — when the farmer’s markets locally are closed — to still buy local vegetables or anything special that’s needed (usually for catering). Love their mixed microgreens. We also love doing shrimp boils and oyster roasts. We will only use local wild caught shrimp. 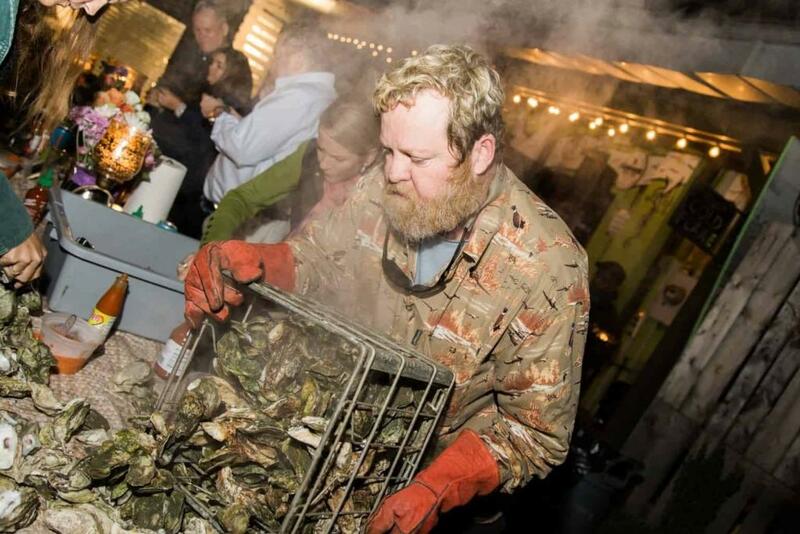 And we also use Bulls Bay oysters for our oyster roasts. SCDNR has a user-friendly oyster recycling program that we use to deposit all the shells afterward. Would love to have your recipes their AWESOME.